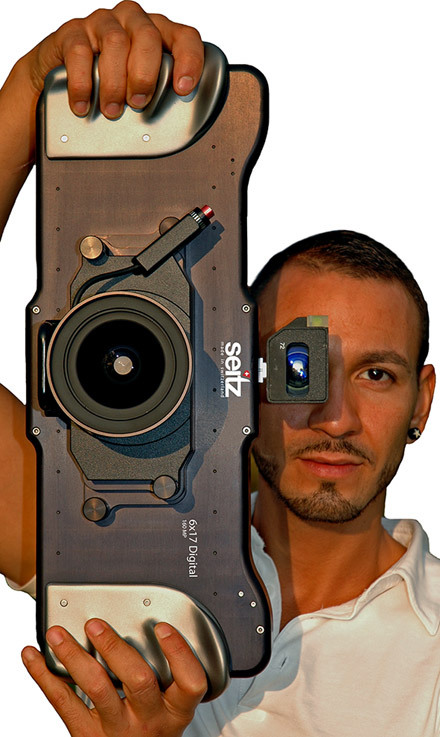 When we first spotted this new cam from Seitz, our jaws hit the floor and rebounded a few times. No, it's not the highest megapixel count we've seen, but this megalith of a camera shoots at 160 megapixels to create a native 6 x 17-cm image, is packed with an ISO range from 500 to 10,000, a read-out speed of 300MB per second, and a shutter speed of 1/20,000th second. So the next question is, how are you going to store such huge image files (nearly 1 GB per uncompressed full panorama), certainly not on your off-the-shelf 16GB SDHC card, nor the upcoming 64GB CompactFlash cards -- but rather via gigabit Ethernet to Seitz's "state-of-the-art computer system", which translates to a decked out Mac mini. So what will this much imaging power cost you? 45,500 Swiss francs ($36,266) for the "mobile version" and 42,300 Swiss francs ($33,715) for the "studio version", and we're assuming that the Mac mini is included for that price. However, given that this camera isn't quite what you'd front for a down payment on a Swiss châlet, the 6x17 Digital surely must be affordable to average working-class Zürich banker set, no? You can catch a glimpse of this bad boy at the upcoming Photokina expo in Germany, or can throw down some serious Swiss coinage now to pre-order this gargantuan cam, which won't become available until early 2007. Also, be sure to click through for two more glamour shots.